Rod Taylor played a prince in exile in the final episode of the long-running CBS anthology series "Studio One." Sponsored by Westinghouse, "Studio One" produced hundreds of teleplays from 1948 through 1958 and was considered a prestigious series with good casts and good material. It started in New York and moved to the west coast in 1957, when it was henceforth known as "Studio One in Hollywood." Upon its demise, "Studio One" was replaced by another Westinghouse-sponsored series, "Desilu Playhouse," which featured Rod in an episode in 1960. Reviewers of the day lamented the passing of "Studio One," calling the final episode "an unwelcome television milestone." They praised "Image of Fear" as being worth seeing because of its "absorbing acting" rather than the merits of its teleplay. Such an assessment seemed to be typical of some of the series' later installments. The final episode was directed by Buzz Kulik, who worked with Rod in several other Golden Age of TV anthology series. Lili Darvas, Rod Taylor and Eugenie Leontovich. 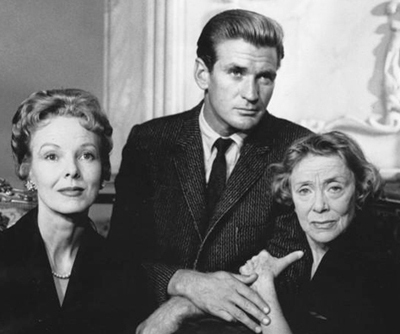 "Image of Fear" featured a distinguished international cast. It starred two grand dames: Russian-born Eugenie Leontovich as the exiled Queen Andrea, and Hungarian-born Lili Darvas as her sister, Felice. Our Australian Rod played the queen's son, Anthony Fouche. Netherlands-born Nina Foch played his wife, Lee, and countryman John Van Dreelen played Capt. Philip Clary. Rounding out the principal cast was Canadian Donald Harron playing Francis Fouche, the queen's nephew. The story involves a royal family that has been in exile for 20 years in the United States. Capt. Clary brings them news of a revolution in their unnamed country, and the queen has hopes of returning to power. Intrigue arises as someone tries to kill the queen. The prime suspect is her son, Prince Anthony, who was told that he must give up his wife if he returns to the throne. Over its 10 years, "Studio One" has given TV some of its highest hours, starting with the very first show, on Nov. 7, 1948, when Margaret Sullivan starred in "The Storm." Tonight is the 479th and last, a brooding study of an exiled queen about to return to power. The actress who played the queen, Eugenie Leontovich, seemed almost like a royal in exile. Her family suffered in the Russian Revolution, and she came to the United States in 1922. She became a noted stage actress in New York as well as director, playwright and producer. In the 1950s, she established herself as one of the great acting teachers, and her students honored her stature by referring to her as "Madame." It is from this regal setting that producer Peter Kortner coaxed her to play the lead in "Image of Fear." The Paley Center for Media: The museum, which has locations in New York City and Los Angeles, has this episode available for viewing.